Aug 8th 2017... JJ was the manager back in 2008 when we last won our opening fixture (3-0 Hamilton, thanks Dillinger! ), so we shouldn’t really be surprised that we came away with nothing this time around, even with another JJ in the mix. For me it’s a formation problem, Lee has a vision of what he wants but with Power’s fitness below par and Dicker still injured we have no real support for Frizzell in there to play at his best. We look infinitely better without the spare man in the middle and Erwin up front complementing Boyd. Lee McCulloch has made too many good signings to single them out, and we kept hold of our best players from last year, so I’m confident that despite the sluggish start we will improve when the team has time to gel properly. Well done to the “Trust In Killie” lads who played in the Legends match at the Open Day on Sunday past; Hooky’s Heroes beat Monty’s Marvels 4-2 and everyone seemed to enjoy the return of the popular fixture. Aug 15th 2017... I think we can officially say we’ve not had the best start to the season, and we face the strongest team in the league again next week, not one I am looking forward to. The knives are out for the front line, the midfield, the defence, the management, hell even the pitch is getting it, such is the ire of the of our fans at recent results. Sadly, I would have to agree with them all…being this bad is a collective effort…and we’re a shamble at times. We need to find a formation and preferred starting line-up as consistency is key, but there are a few positions that Lee is struggling to fill and that is playing havoc with our game plan and rendering the good individuals we have ineffective as a unit. In short, it’ll get worse before it gets better, it’s not pretty but we have to try and persevere. I certainly don’t have all the answers; but I’d start with Erwin up front and Boyd used as an impact sub; Thomas and Jones on the wings with Wilson back as a defensive midfielder until Dicker is fit. Frizzell will do better with Wilson in there beside or behind him which would leave McKenzie spare to support the front man. Defence is a real nightmare but I think Taylor can hold his own in there with more support. Greer has been a steadying influence but Broadfoot has had a nightmare so far so and is suspended so we need to look elsewhere for someone to partner Greer, Higgins? O’Donnell needs to shape up or ship out, we can’t continue using players out of position to cover. I’m happy with Jamie Mac or Bell. We can’t keep changing the manager, being “inexperienced” never hindered Shiels, Williamson or indeed Waddell. The pitch is too narrow and too dry, but we’re stuck with it for now. Everyone’s an expert eh! Tell us your opinions on the Killie Kickback forums. Aug 22nd 2017... Well if nothing else we are consistent, that’s another loss under the belt and our woeful home record continues. That said, it wasn’t as bad a defeat as many anticipated and other than the goals we lost at the end of either half, we looked pretty organised and going into the last few minutes could well have sneaked a draw. O’Donnell certainly shaped up and probably had his best game for us so far, and Wilson (the new Fowler?) just gets on with it no matter where he is asked to play. There is going to be a lot of expectation heaped on Dicker and Kiltie when they return, we should really try and start to put some points on the board before then, starting this Saturday against the Accies. Support is crucial, the low turnout against the shell suits was disappointing, let’s rally this week and get the season kicked off properly. Aug 29th 2017... So close, but yet so far, I honestly don’t think we could buy a win at the moment! All those home games in a row did us no favours and won’t make things easier for us later in the season. One point out of a possible twelve in the league is dreadful form any way you look at it, but it is only one less point than we had last year so there is a long way to go yet. I think the team after Boomer was substituted is the strongest looking I have seen to date, and with Dicker in there for Smith and Kiltie in the mix I still have some semblance of hope going forward. I hate singling players out because we all make mistakes, but what was a player of Smith’s experience doing making that challenge? It cost us the three points, not good enough, I don’t think in our situation this international break will be a good thing, extra training required! Sept 5th 2017... So, the transfer window has now officially slammed shut, although to be technical for us it is still slightly ajar because we are only in the market for freebies. The midfield maestro we were all hoping for never materialised and surprisingly there were no exits, even loans, despite us having a rather large squad. That is not to say that we did not strengthen the ‘team’ with Scott McClymont from STV joining the back-room staff as our new marketing and media guru. If anyone needs good marketing and media right now it is us! Scott has always been a good guy to deal with and I hope that he gets all the backing he needs to be successful in his new role. Belated congratulations as well to Allen Kyle on being appointed as our new Supporter Liaison Officer, his predecessor had a tough time of it but Allen is his own man and fortunately won’t have to contend with the same kind of nonsense. Sept 12th 2017... To say the natives are getting restless would be an understatement, the old internet is ringing out for Lee McCulloch’s head as the bad results continue. This won’t be popular but I say that it is still too early to press the panic button. Maybe after the Dundee and Ross County games I’ll reconsider! One thing is certain though, there are a lot of so-called professionals who need a right good kick up the arse, and a lesson on what it means to play for the mighty Kilmarnock FC. The club as a whole lacks leadership…it’s time to bring in Davie Mackinnon or someone of that ilk to help us steady the ship. The current squad should have been at the Stars of ’97 lunch on Sunday and had the chance to speak to ex-players who would have run through brick walls for us. You can bet if Monty had been on the piano it would have been Paper Roses all the way. Sept 19th 2017... Irony is a cruel mistress as we win what can probably deemed our best point of the season and yet still slipped to the bottom of the league. No one, including me at my most optimistic (doesn't happen often), honestly thought that we had any chance of taking points from the lamb lovers who are by far and away the second-best team in the league at the moment. Fortunately, the team didn't get that memo and battled hard to bring a point back to Ayrshire. This is the kind of grit and determination that we will have to show more often to keep up with the pick and get us back off the bottom of the table. Kudos of course to each and every Killie fan who made the trip north out of hope and faith rather than anything else, dropping a place was a bitter pill to swallow but form is only temporary and our class will eventually shine through. Sept 26th 2017... This weekend saw another home game for Killie but sadly still no sign of our first league win. We got away to the worst possible start against Dundee and although we salvaged a point, it failed to put a smile on the faces of our beleaguered fans. The pressure is mounting on manager Lee McCulloch and if we fail to beat Ross County this week the board have a decision to make. The fixture scheduling sees us with five away games in a row after County and it really is difficult to see where the points are going to come from. It's never a healthy situation when a club has to continually change managers in a desperate attempt to find some long-term stability but that has been the "Killie way" in recent years. I genuinely hope McCulloch turns things around but the clock is ticking. Oct 3rd 2017... It has been an eventful week in Kilmarnock with sad events dominating the news. The untimely passing of club photographer and all-round nice guy Sandy Ferguson was a huge blow to our community and my condolences go to his family and many friends, of whom I was honoured to be one; he will be a huge loss to everyone. Saturday’s match compounded the misery with a pedestrian performance and a deserved loss which prompted the departure of Lee McCulloch and Peter Leven by “mutual consent”. Both were decent blokes, but more amiable than effective, and their fate was ultimately decided by poor results. There can be no doubt that the appointment of a new boss and putting some sort of management structure in place will be crucial to our club and its top-level survival…we need leadership, fast. There have been a raft of applicants already but some of the names being mentioned are way off base, Billy Bowie has confirmed that we want someone with both experience and tactical knowledge and if we have to pay compensation then we will. One glimmer of light came from FC Kilmarnock Ladies who won their league and promotion with four matches to go, well done to everyone involved! Oct 10th 2017... It is crunch time at Rugby Park with more potential managers getting interviewed than turn up on a Saturday these days. The board are quite right to be going through a formal vetting process because internal promotion only tends to work when the outgoing manager was successful and we've not had that for a wee while. The usual suspects have all thrown their hats in the ring and credit to board for being proactive and approaching some top names who they thought might be a good fit. The bookies are quoting all and sundry so we ran a poll on Killie Kickback and social media to see who the fans fancy among the front runners. Nearly 900 fans voted and poor old Gus only got one vote so I don’t see him being a popular appointment he's still in a job anyway. Next up was Jim McIntyre with 6.89% of the vote, Gary Holt on 8.36% and big Mixu trailed in second favourite with 13.67%. Currits seems more popular as an assistant boss, but we don't pick them, the new manager will; I don't think fans want to see Holt get the job just now as we are in such a precarious position. The most popular by a country mile was surprise contender Steve Clarke on 70.9%, I’m happy with the fact we’re even talking to someone of his calibre! Of course by the time you read this we may know already. One thing is for sure, whoever gets the nod we will have to back them 100%. Oct 17th 2017... Ask and ye shall receive eh! Target identified, pursued and persuaded to sign on the dotted line for Ayrshire’s finest. Big Marvin is not the only bloke in Kilmarnock who was happy as Larry this weekend! 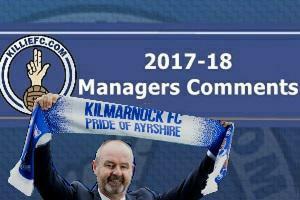 What a coup this is for Killie, Steve Clarke must surely be the most qualified manager we’ve ever appointed, certainly in my lifetime. Kudos to Messrs Bowie and Kiltie for pulling this off, and still within our budget they said at the press conference on Monday. The highlight for me though was the sea of smiling faces in the pub in Glasgow on Saturday, and that was before we gave Thistle a football lesson and eased off the bottom of the table. There were no disappointments on the park but Jones and Frizzell were exceptional, what about that goal! Clearly the wee man is revelling in being sponsored by Hippo and myself this year. Yes, I am trying to be funny, but there is no emoji available. Oct 24th 2017... No game this week due to Glasgow's newest team getting papped out the League Cup by Motherwell, but we do take a trip to the big house on Wednesday. There has already been some outrageous talk about Steve Clarke being the best Killie manager ever, on paper, and I would like to ask that we give the guy some breathing space and a chance to do his thing. It is a long time until the transfer window so Steve will have to work with the same players that McCulloch had at his disposal, and by their own admission they let him down badly. Lee’s a really nice guy and I’m sure he’ll do well in the future but I think the Killie job came to him too early, brought about by the sharp exit by his predecessor. The results of the next two matches are not hugely important and as long as we show improvement and a willingness to compete I will be happy. It's going to take some real determination and hard work to get any kind of result in Glasgow but I'm sure the new management team will have instilled some fire in the player's bellies. Oct 31st 2017... There were no sub-standard performances in week 13 of the season, which was unlucky for some but certainly not Ayrshire's finest. We asked for grit and graft in Glasgow last week and that’s what the players delivered, in spades. The subway loyal were probably half way home on Wednesday when the referee started making up his own rules and gave the home side a penalty. No problem for the mighty; save the penalty, sweep up the park and score. Cue scenes in the away end, the likes of which we have not witnessed since DVT at Hampden. Next up was pure gold from Jordan Jones at shell suit city on the Saturday. He started the move, he finished the move...he’s apparently indestructible! In the last three matches, we have kept our shape, looked organised and exuded a confidence that saw us exit Glasgow undefeated. Fingers crossed the home form hoodoo is put to rest soon. There will still be a few bumps in the road ahead but if we stand with Steve Clarke I’m sure we will see real progress. Nov 7th 2017... The Rugby Park hoodoo still haunts us as we threw everything including the kitchen sink at the Hibees and yet still lost 3-0. The fans appreciated the effort and got right behind the team which was in turn lauded by the players who promised revenge on the other Edinburgh team...and so it came to pass. We can now boast of a 100% win record at Murrayfield with Boomer doing once again what Boomer does (113 and counting) and the Mighty Atom Frizzell coming off the bench to hit a sublime winner for the team that just doesn’t give up any more. The change in attitude alone is fantastic to see and I can’t wait to see what else Clarke and Dyer have in their locker given time. It’s ironic we got more points from the Edinburgh two than Glasgow’s twisted sisters, but when that home hoodoo is finally busted, someone is getting a tanking! Massive congratulations again to FC Kilmarnock Ladies who lifter their league winners trophy on Sunday, Davie Howie really has things on that front going in the right direction as well. Nov 14th 2017... They don’t like us much in Dundee, this we know from previous encounters with the Tayside constabulary and over officious stewards at both Tannadice Street dumps. In the name of the Good Lord Wullie would you please build a decent stadium between you, if the Milan teams can do it so can you. This Saturday at Dens they are putting us in a stand that was built when Moses was a boy and charging us £24 for the privilege, yet we offer far better views and facilities and charge them £4 less! Now it is all very well saying that we should charge them the same £24, but the league doesn’t allow us to do that without charging our own fans more as well. It would also make us as guilty as Dundee in pricing people out of the game, it’s the fans not the clubs who suffer, twenty quid is indeed plenty. The SPFL should really do something about pricing policy and bring in some sort of standardisation. How about each club sets its own walk up price and that’s what their fans get charged wherever they go? Finally, well done to Jordan Jones on his international debut, sadly he won’t be going to the World Cup but it was great to see him thanking Killie on his social media for giving him the opportunity to shine…like gold maybe? Nov 28th 2017... Ten minutes of madness was enough to spoil a week of preparation and neither Steve Clarke nor the fans were amused. The boss switched things up at half time and we looked to be back on track, but we were caught on the break and the sucker punch goal gave the Dons all three points. Good to see Dicker back though, and Kiltie will get development game time starting this week. Meanwhile in Germany, Tommy Adams did his final charity trek with our good friends from Kaiserslautern. All the money required has been raised and Tommy has asked me to pass on his best wishes to everyone who played a part. Monday 4th December sees the Killie Trust AGM at the Portmann Hotel (7pm for 7:30pm), all members are encouraged to attend and if you are not a member there is still plenty of time to sign up before that. Dec 5th 2017... Goals from Findlay and Brophy saw Killie do what we have done of late and take all three points from Perth, mind you they tend to win on our patch as well. With Jones out, a few players used the opportunity to stake their claim in the first team and have given the boss a pleasant problem come Saturday against Thistle with J2 back in contention and Mulumbu probably fit. Changed days indeed. Once again, the travelling Killie support proved that rain, hail or RTA they will be there to back the team and it would be fantastic if we could recreate some of that atmosphere at home matches as it really spurs the players on. Let’s try and get as many fair-weather fans there against Glasgow’s second biggest club at the weekend…time to noise up your mates who don’t go as much anymore and let them know that Killie are back and their presence is required! The Trust AGM had its traditional low attendance, which to be honest is slightly disheartening every year, but in reality, as long as we are signing up members and getting subscribers to TIK, doesn’t really matter. The good news is that active membership is up 380% on last year and at an all-time high (479) and by the next financial update we will be on the cusp of £60k in the bank and the countdown to reaching the first milestone and a supporter director on board is well and truly on. 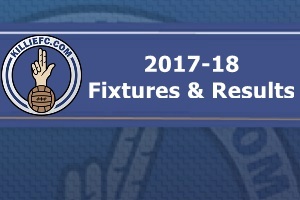 Trust in Killie is a long-term project and getting as many fans on board as possible is a massive move towards the club having a sustainable revenue stream out with traditional realms for the first time ever. It is going to allow the club to invest in areas which we would otherwise have to ignore and be hugely beneficial to the support who are putting the money in. This is the way forward…Trust in Killie, trust in yourself. Your club - your time. Dec 12th 2017... The home hoodoo was well and truly bust at the weekend as the mighty cracked in five against Thistle and moved us up into eight place, within three points of a top six slot. Hopefully that will put an end to all this stuff about the pitch being to blame for our terrible home form. I think to be fair that the majority of us would rather we moved back to grass, and that the board have every intention of doing that when we get our new training facility up and running. Meanwhile, we should just get on with what we’ve got, the surface is perfectly acceptable and hats off to unsung heroes Mark Gallagher and Yeti for the sterling job they do in keeping everything up to scratch. Look out for KFCSA and Trust Xmas raffle tickets which are on sale now. 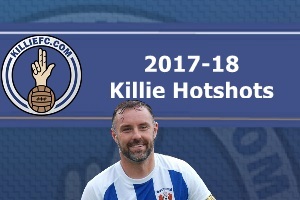 Details are also available at www.TrustInKillie.com of how to get your name on the TIK History Board, if you are not already on it or are looking for a fantastic festive gift for someone special, like yourself! Dec 19th 2017... Back to back wins at Rugby Park, unimaginable only a few months ago it would seem. Not forgetting a creditable fight back and point in Dingwall with a good showing from both players and fans who trekked north in the deep of winter. There is a lot of talk about winning ugly, but you can only respond to the team you are up against, and they were plenty ugly. Motherwell did what they thought they had to do and kicked lumps out of anything that moved while lumping the ball up the park at every opportunity to cut out our midfield. It was frustrating to watch at times and their tactic appeared to be paying off although the statics show that we had more possession and more shots on goal over the 90 minutes. We stuck to our task and the other Boyd probably kept himself in the pans for next week with a well taken goal just before half time. I’m loving it. Some of the top six and Euro chat is a bit worrying though, we need to cut ourselves some slack and I’ll be happy to finish anywhere outside the bottom three this year. We have already seen some minor miracles in terms of improvement but there is being positive and there is lumping unneeded expectation on the team. I have a feeling we are going to do just fine, but we are in this for the duration and it is important that Steve Clarke is given time to re-build his squad from the ground up and we should not get caught up in putting instant gratification ahead of long term success. A great effort by Killie and Motherwell fans who decided to “Bring a Gift” to the game on Saturday to bring some festive joy into the lives of those less fortunate, well done to the KFCSA, Trust, EACHa and the club of course for making this happen. Dec 26th 2017... Three in a row at Fortress Rugby Park, tongue firmly in cheek there if we are honest, but its looking tasty going forward! It seems like a long time ago now and we have a match on Wednesday night that will also not be easy, but the blue and white army is definitely on the march. We hammered Rangers in the first half and then lost a goal against the run of play and the second half was starting to look like more of the same, nothing was falling our way. We don’t do giving up any more though and eventually the pressure paid off with a quick time double from Boomer that shut all sorts of people up. The boss did something similar at the AGM last week when he totally nailed all the speculation linking him with a move to Glasgow, the press trying to upset the squad, must try harder. Have a great Killie new year everyone. It’s a new dawn, it’s a new day…and we’re feelin’ good. Jan 2nd 2018... It looks like the tactic to take on the new improved Killie is quite simply to keep the ball away from Mulumbu, Dicker and Power! Or if you are Hamilton just make a fist of keeping your pitch playable. We really missed the Wolf (Brophy) at Easter Road and it upset the rhythm of the team, but it takes more than that to stop Boomer scoring. Hibs dominated without a doubt but we defended resolutely and only a mistake by Jamie Mac let them in. It was a bad one but the fans got right behind him and his gratitude was plain to see. Story of the day though was the Howard’s Samo ‘abducting’ an Australian and taking him to the game where the Burns’ lads got him in and showed him the ropes...despite their bus breaking down! Great teamwork and solid work by the 20/20 keeping Harley away from the dark side. Jan 9th 2018... The winter break for us seems to be little more than a time for speculation. We have all heard the stories about Jordan Jones going to Glasgow’s newest team, but surely the winger has more ambition than that, and how can they afford him? We are not taking IOU’s from that lot, we’d never see a penny of it! The signing talk from our own perspective seems to surround Kid Goals who appears to be on his way out of Norwich. Don’t get me wrong, it would be a fantastic signing and I’m sure that he’d be a star player for us again, but I think it’s just a bit too soon for it to happen. He’s reputedly on £50k a week and could still easily play at a higher (paying) level than the SPFL, maybe next year though. Our manager is going to get mentioned for any and every position which becomes available as long as he’s with us, this week it’s the Scotland job, I think we’d better just get used to that, if no one wanted him it would be time to worry more! Jan 16th 2018... There was some Killie recognition from the SPFL this week for manager Steve Clarke and veteran striker Kris Boyd. The duo scooped awards following our remarkable resurgence in December which really made people sit up and take notice. I am not one to put much stock in such plaudits normally, because all too often we get ignored, but in this case, I think both thoroughly deserve the credit. Clarke has also impressed the fans with his handling of the press, he doesn’t take any nonsense. When Sky interviewed him about the recent bid for Jordan Jones it was amusing to see him try and not laugh at the derisory offer. The sense of entitlement and the pure seethe from the Sevco rank and file is quite astonishing. Maybe they should remember where trying to buy titles got them previously? The rumour mill is still in overdrive with talk of Naisy, a new goalie and a central midfielder from the EPL all quoted. It would be nice to see a fresh face or two, but if SC is happy as is, that’s good enough for me. Club legend Boomer launched a charity dedicated to helping people with mental health issues, if you see any links on social media please like and share to get the message out there. Jan 23rd 2018... With two midweek home fixtures cancelled it is a good job that the Scottish Cup game against Ross County went ahead, and, why wouldn’t it? Mark Gallagher and Yeti to the fore once again proving to Hamilton that keeping an artificial surface playable in arctic conditions is achievable, if you know what you are doing. Ironically, with Mulumbu missing the match we made a bit heavier weather of things than has been the case of late. St Johnstone target Rory Mackenzie was clever enough to be ‘fouled’ in the box late on and the new improved Lee Erwin made no mistake from the spot to see us through to the next round against more highlanders, the Rangers with history, Brora. Best performance of the day though had to be from the Paninaros in the hospitality seats. Over 120 of them convened to pay their respects on the first anniversary of their comrade Guinea’s passing…a fitting tribute indeed and he would be proud of every one of them. Jan 30th 2018... It has been a long time since we came home from mutton central with anything to shout about and Saturday proved to be no exception. The first half started slowly and gradually got better and by the time our seventh all-time top scorer did a ‘McEachran’ we were all over them. That was to be it for us though as we literally lost Power in the second half and our reshuffled team couldn’t contain the resurgent home side. As we said on social media after the game though, we win as a team and we lose as a team and we should still be proud of the away record that we had been trying to maintain. Hopefully now that we’ve signed defensive midfielder Tshibola on loan from Villa we will have more cover in that area and Power recovers quickly. Nearly 400 travelled and some of our good friends from Kaiserslautern were over for the match, sadly they have not seen many wins this season, fingers crossed they improve like we have under Clarke. Feb 6th 2018... Beating Celtic wasn’t really the best part of the weekend, feeling we thoroughly deserved it and not being surprised probably was. The lack of fear from the players and the support at the moment is something we have not experienced for a while, it’s a crying shame not more fans were there to see it in person. Hopefully the longer Steve Clarke stays the more will come back, although the media seem to hate how successful we are and are trying to wish him into the Scotland job…whilst never once mentioning Brendan Rogers, who has done not bad for himself either. It is difficult to single any players out from Saturday but kudos to Mulumbu for upstaging Broon, brilliant cross for the goal from Jones…and the work rate of Mackenzie and Brophy was outstanding. On and off the park things are looking up, the Trust’s TIK Initiative reached its first £100k target already, great work…these are the times you heard about, it’s good to be a Killie. Feb 13th 2018... It was our sixth home win in a row as we went to press but I’m not going to jinx us by making any predictions about the Dundee game. It was great to see Kiltie back and Tishbola get a start on Saturday, but the boss was not making any wholesale changes as he knows how important a cup run is to the club and the fans. The first half was workmanlike and we took our time to edge in front, but were never in any danger. We strolled the second half though and the only thing that could have stopped us was running out of change for the electric meter. There are still many tough matches ahead in the league and cup and the team are going to need our support. A trip to Aberdeen probably was not the draw we would have preferred but while there is caution there is no longer fear, we have proved we can go toe to toe with anyone. Feb 20th 2018... No jinx then and we hit the seven wins at home by beating Dundee, not the easy way, but it was a real spectacle for the fans…the referee could have done with some as well. It’s all about the fighting spirit these days and that showed again at the weekend. We struggled to make a breakthrough against a dogged Motherwell side, but we never really looked in any danger. JJ wasn’t having any luck at all but his triple ‘meg had the fans delighted and showed what he is capable of, you can expect to see that going viral. Likewise, Stephen O’Donnell, they were coming down his side all game and trying to wear him down, then up he pops with his second goal in a week. He’ll be getting a call up from the new Scotland manager (god bless you Alex McLeish) before we know it. We are a veritable juggernaut these days, it’s great to be giving other teams the fear. Feb 27th 2018... Another midweek game so I am going to try avoiding making a prediction again and hope we get the same result as the last time! There are slow starts and there are what we endured in the first ten minutes on Saturday against Hibs. I stopped for a coffee before going to my seat and got to the top of the stairs and saw the ball hitting the back of the net. When the second one went in, it seemed like Hibs were exploiting any slight deficiency in our game, but they didn’t account for our new ‘never give up’ attitude. Ironically at the end most Killie fans, including the gaffer, walked away from the match a bit disappointed we never took all three points. The statistics from the second half bear that out, with only a couple of outstanding saves keeping us at bay. It was an exciting match for the telly, hopefully that will entice more punters back to see the mighty in action live. March 6th 2018... I am going to stop mentioning midweek matches and deadlines, because we seem to have one every week recently! The Wolf pounced early doors at Tynecastle to the delight of a large travelling contingent. The match was a bit huff and puff and we could have lost it in the end was it not for some heroics and a penalty save by Jamie Mac. You know what I think about any point away from home...sorted. Come Saturday yet another massive regiment of Steve Clarke’s blue and white army traversed the frozen northern wastelands seeking Scottish Cup glory. We suffered an early set back against the Dons but J2 was sent crashing in the box in the second half and BOOM, Boydie rattled in his 124th for the mighty from the spot. There is a lot of talk about getting bums on seats for the replay a week on Tuesday, but first things first. Let’s fill Rugby Park on Saturday, our away support is phenomenal, the team deserve the same at home. March 13th 2018... Another two games, another six points, another midweek game this week that I’m not saying a dicky bird about…seems to have worked so far. It’s a strange sensation going to games now and actually expecting a good result every time no matter the opposition. The players now have belief installed in them by Clarke and Dyer and the fans are only too willing to get caught up in the positivity. Jordan Jones was virtually unplayable at times in the St Johnstone match and was involved in almost everything, yet we managed a comfortable win on Saturday without him. It seems like every player brought in is fighting for each other and fighting to stay in the team. We totally cruised it against County but had a stark warning of what can happen if we slacken off thinking the job is done. I’m more than sure that Steve Clark had a few words to say in private about that; in public though, as ever, he backed his players because as he always says…together we are stronger. March 20th 2018... We can’t win them all, but we are not far off it! Aberdeen knocked us out of the Scottish in the replay last week but it took 210 minutes and the lottery of penalties for the second best team in the country to get past us…we are nobody’s mugs. Someone should have told the bookies that as the Killie army bashed them, and Glasgow’s newest team, at the weekend. Unfortunately I had to miss this one out as I had something else on, but I did manage to find a bar in Philadelphia frequented by exiled Bears to watch the match. I was welcomed with open arms at 10am for a few sherbets, come the end of the game though I don’t think I was as popular and made a hasty exit. Swings and roundabouts…being Killie in Philly on St Patrick’s Day, I didn’t have to buy a drink in any of the many Irish pubs all day! Scottish football has now deemed us unworthy of such a good manager and will henceforth campaign to get him appointed anywhere but at Killie to try and restore the ‘natural order’. Get it up the lot of them! March 27th 2018... Loads of matches squeezed into a short space of time to allow for a winter break…then no matches for numpty international fixtures that no one bothers their back sides with! Killie were well represented in the Under 21’s but surprisingly Scotland’s form team had no one called up to the seniors…surely Stephen O’Donnell deserved a chance? Tommy Adams and I went to the Excelsior Stadium to see the U20’s in their Scottish Cup quarter final against Motherwell on Friday afternoon. It was all a bit David and Goliath as we have a lot of small players, but they have big hearts and battled constantly to get a deserved win and a place in the semi-final against Aberdeen. Stand outs were Cameron, McLevy and Samizadeh, who scored two and harried them all game. If he would pass the ball now and then he could be worth keeping on. Paterson netted the free kick that put Killie through and Motherwell finished with nine men and their coach sent to the stand. Discipline…we had bags of it, they had none…well done to Andy Millen and his boys who did us proud. April 3rd 2018... We are in danger of getting a bit blasé about winning as we seem to be able to just turn up and hit the ball in the general direction of the goal and it goes in! I’m kidding of course, there is a ton of hard work goes in all week and that is what pays off on match days. We now play as a cohesive unit and you only had to see the strength of our bench on Saturday to realise how difficult it must be to get a starting place in that first team. Mulumbu, Jones, Kiltie and Wilson had to sit and watch most of the game as we routinely put Accies to the sword. A sublimely taken chance by Erwin and a punt/glance combo from SO'D and Dicker was enough to take all the points on the day. Who would have thought eh! The good news kept coming all week as top players committed to extended contracts and individuals we all thought would go are now happy now to stay. And we are happy to have them…positivity reigns supreme. April 10th 2018... The mighty Ayrshire Killie are now the only team in our league that have won five games on the bounce, and we still top the form charts as well. 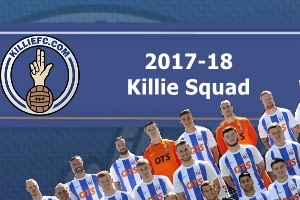 The split is nearly upon us and I do not know a Killie fan who wants the season to end! A highly impressive 1,663 turned up at Firhill and it was big Findlay who provided the thrills with a bullet header from a Jones cross to give us all three points. He was ably accompanied by former liability Kirk Broadfoot, you won’t catch many saying that about him any longer. The defender was in the hotel last week paying for a coffee after training when he was approached by a sprightly 92-year-old fan for a quick chat. Broaders stood there with him for almost twenty minutes and hung on every word the elderly gent was saying. I was highly impressed by his attitude and it is great to see that kind of interaction and respect at our club again. April 17th 2018... Big Kirk Broadfoot is getting a mention this week again after mystic Hippo advised us to back him for first goal scorer at 40/1 for the fourth week running. It was a happier than normal bus heading home from Hamilton for sure! Remember kids, when the fun stops, stop, only there seems to be no stopping the Mighty at the moment. Again with key players missing we toiled a wee bit in the first half, but never looked in any danger. Boydie’s 128th goal sealed the 2-1 win (we even score their goal as it bounced in off Fasan’s back) and sent the 2,505 Killie fans home happy. Unbelievable in this day and age that we can go to another SPFL team’s ground and have 700 more fans than them…and this for a ‘nothing’ game. Take a bow the Killie support! It was also great to see the players at the POTY Dance on Saturday night, and staying to the end partying with the fans. Don’t give up the day job Jordan! We are a breath of fresh air in Scottish football, the media clearly don’t like it and are trying their hardest to get Steve Clarke moved to Govan. Jack Ross has had a bit of success and he’s getting the same treatment as Steve or anyone else that has shown a slight bit of promise. It’s getting boring now, lazy journalism and tired speculation at its worst. Killie are embarking on this Project Brave thing next season and we are considering using the Ibrox club as a feeder team. Well if we are publishing made-up stuff we may as well make it sound believable. April 24th 2018... First of all let me say that the better team on the day ultimately took the points on Saturday, the sheep took their chances and we never. That said, what a bunch of diving, cheating and whining gits they are! Honestly, if I was one of the 500 fans who travelled (clearly not famous any more) I’d be embarrassed by some of the antics of the players. Referee Nick Walsh was hopeless yet again, you’d think he would do better with so many Dons players eager to help out and make decisions for him! The stats show it was a more even game than I thought at the time, but we certainly missed a few key players who will hopefully return next week. The good news is that next term’s season tickets have now been released and the price increase for early bird purchases is fairly minimal. Fantastic that we are opening the Moffat Stand again, disappointed we’ve not attempted to resolve the ‘no old firm games’ issue, we need those families there at every match. May 1st 2018... No idea where to start about the weekend, what a game that was and without a doubt the showpiece of the SPFL. Maybe if these two managers were up against lesser opposition every week they’d have had a better shot at winning the manager of the year award? Not that we’re bitter of course! It is amazing that Clarke and Boyd got nominations, it just goes to show what has been achieved this season. The match was literally end to end with the first half only being spoiled by the referee who gave us nothing, one of the penalty claims was an absolute certainty. Hibs, to their credit, are a really good footballing side and despite a few of them going to ground too easily, they were not as half as bad as the Dons the week previously. 130 goal Boomer’s free kick was a peach and it is such a shame the ‘goal’ to level the scores at 4-4 was disallowed, what a contest though, now that’s entertainment! Massive credit, again, goes to the Killie travelling support, the fact that both sets of players were applauded off the pitch by both sets of fans at the end says a helluva lot. May 15th 2018... Another point off the champions and a home win at the weekend, it’s the story of our season really. Erwin pounced to lash home the winner in the first half against Hearts and Killie finish with more points than we’ve ever had in the SPFL since being back in it. Veteran Kris Boyd also managed to finish as the only ever top division goal scorer we’ve had in the same period, it has been an immense season for the big yin. The man behind it all, Steve Clarke, ably assisted by Alex Dyer and his backroom staff, has now lifted the Sportswriter’s Manager of the Year award, and quite rightly so. A heartfelt address to the support at the end of our final match summed up how important the fans have been to him and he gave everyone credit for our meteoric rise up the table. It is important that we match the manager’s ambitions in the upcoming season and purchasing a season ticket and subscribing to the Trust In Killie initiative are just two ways you can do that. 2017-18 has been a blast, I can’t wait until we go again.